Roswell researcher and author Tom Carey told the crowd at American University yesterday that he has the “smoking gun” to prove once and for all aliens are real. According to an article by WTOP in Washington, Carey claims to have a picture of an alien, but did not have the picture with him. Carey has been researching the alleged crash a flying saucer in Roswell, NM since 1991. He is a co-author and researcher of a couple of books on the topic with his research partner Don Schmitt. He told the crowd that the images are on Kodachrome color slides and that their research on the legitimacy of the slides has been promising. He says he received the slides from a couple in Texas. “The woman was a high-powered Midland, Texas, lawyer with a pilot’s license. We think she was involved in intelligence in World War II, and her husband was a field geologist for an oil company,” claims Carey. The UFO community has been excited about the American University presentation, which was largely made up of very credible researchers. 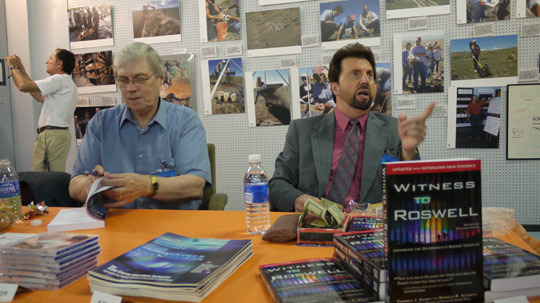 The event was a panel discussion called UFOs: Encounters by Generals, Pilots, and Government Officials. And American University described as including ” four prominent national figures,” and is based on the Honors Colloquium, Alien Contact: Science and Science Fiction, by professor and filmmaker John Weiskopf. The panel also included investigative journalist and author Leslie Kean. 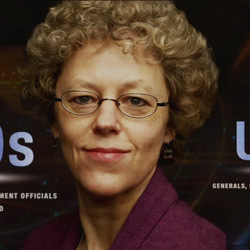 The title of the event was taken from her New York Times best-selling book UFOs: Generals, Pilots and Government Officials Go On the Record. Another panelist was Dr. Richard Haines, the co-founder of the National Aviation Reporting Center on Anomalous Phenomena (NARCAP), and is a former NASA researcher. Apparently, WTOP did not think much of Carey’s claims, but it is hard to fault them since claims are all they were. It is difficult to get too excited when a UFO researcher says he has the “smoking gun,” but he can’t show it to you yet. I think the public often characterizes UFO research as a lot of spectacular claims, without spectacular evidence. Carey and Schmitt’s books are full of very interesting and credible testimony. Perhaps Carey would have been more convincing had he shared that information, which is not well known to the general public. Although many in the UFO community do believe Carey to be a credible researcher, the general public does not know him from the charlatans they hear about in the news. Now the pressure is on for Carey to produce this amazing evidence. He says the images will be revealed early next year. Good people doing good things! By next year the photos will have been stolen or destroyed. 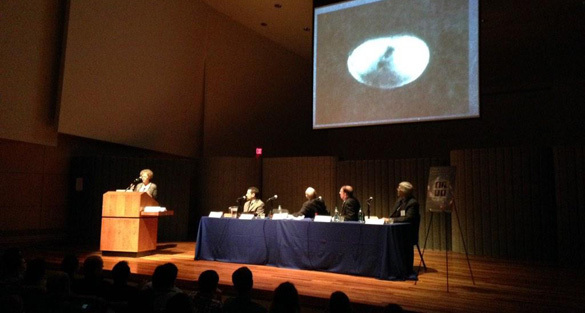 If you can show this picture, it will be, possibly, a big step forward in ufology. But I bet that a lot of people are going to prevent that to happen. So, I urge you to be extremely cautious. I also hope that it is not a new deception, like many others before. Remember the “alien autopsy”! Anyone can find and use old stock if it is in good enough shape. This sounds bogus in the extreme. This guy ranks near the top of the ALL TIME BIGGEST A$$HOLES if he really has those photos and hasn’t released them to the public. The fact that he is claiming to have the world, but is not revealing it, sets off my BS meter. This guy deserves a smack. George Knapp on coasttocoastam just said that the photo is out there on the internet if you know where to look. I can’t find it. You either have the slides, or you don’t. if the veracity of the purported photographic slides has been properly established, then it is the responsibility of this person to bring them to the public, without seeking monetary recompense. hard, verifiable (read, NOT eyewitness testimony) evidence of non earth based intelligences visiting this planet would be one of the biggest things in the recorded history of our civilization; using it for personal gain would be the act of a scoundrel and a knave. I’m going to guess the alleged photos never see the light of day. Sounds like PT Barnum to me. If you have them, release them, it’s that simple…if it’s actually about the research. AAHAHHAHAHAAHHAAH ‘But didn’t have it with him…’ AHAHAHAHAHAHAHHAHAHAHAHAHAHAHAHAHAHAHAHAHAAHHAAHAHAHHAAHAHAHAHAHAHAHAHAHAHAHAHAH! > I think the public often characterizes UFO research as a lot of spectacular claims, without spectacular evidence. If you don’t agree with me, I think we can all agree that after 67 years without proof, UFO researchers should be more cautious than to use the phrase “smoking gun,” especially when “characterising” unpublished evidence. Ms. Kean seems to agree with me! Such as his research partner Don Schmitt! BS. The fact that he associates himself with used car salesman Schmidt is all I needed. It was a balloon yo. $$$ that’s all this little pr stunt is about. If he had anything & was a decent human being, he wouldn’t go shouting it from the rooftops until he actually had it in his hands to back it up. I get the same crap in the mail every week. Ooohh look I got a shiny KEY glued to a piece of paper from the car dealership, it says it MIGHT just be the ONE that fits my brand new free car! All I have to do is go down there so they can run my credit to determine what garbage car they can sell me. What a douche, try making money the honest way for a change. We all know ETs exist, statistically, all the photos, videos, testimonies, even nasa let video from apollo missions slip thru that clearly show discs flying below the command module. Structures are airbrushed out on the moon. We are not children, utube has so much, lets move past are they real and lets discuss their intent and their role in our evolution. I grew up in Roswell. It was a hotbed of UFO activity in the 60s and early 70s. I live in Utah now and have seen numerous UFOs with witnesses. July 2009 – Night…Six (6) UFOs entered the atmosphere above us causing a star-like flash and immediately went into a perfect circular pattern. They held there for several seconds then two went south, two went north, and the other two went east and west respectively. All were gone for about 5 minutes then reappeared in exactly the same place above us. They were stationary for several seconds then ‘stacked’ and went through the atmosphere with a flash. That was very neat to observe. Also, had information from my military days that verified the existence of UFOs. first of all this is great my daughter had a project and she got an a and all she used was this site and some school books this is a great website!!!!!!!! my emai is raul_osorno@yahoo.com or raulosorno1957@yahoo.com. If you contact me and are serious about all this I can provide you wit proof and evidence of the cover up the USA government is delivering to the world.